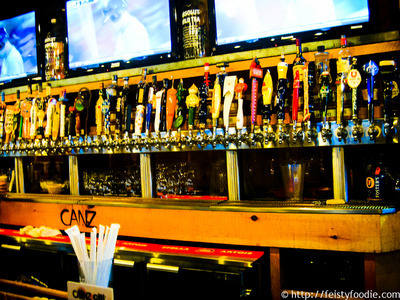 Canz boasts lots and lots … and lots of taps, and a really extensive beer list. I took this photo for Beer Boor, who always insists that beer & food pairings are silly, and one should just drink what you like. I’m inclined to agree… now that I’ve had more experience drinking beer, anyway, though I do find that I don’t like drinking certain beverages with certain foods. They just make things taste funny. Our first $5 appetizer to show up? Sliders. Neither of us knew this came with fries; I think this was an excellent deal, given that it could easily be a meal for one person. 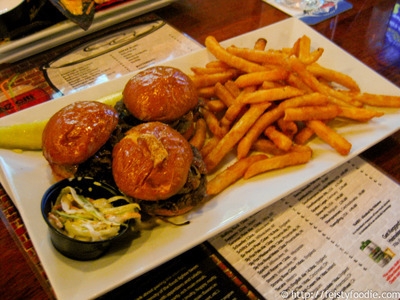 The sliders weren’t amazing, but the caramelized onions on top made them pretty tasty and I enjoyed munching on the fries. The chicken nachos, with unfortunately very overcooked chicken and missing the guacamole we’d requested (which came out after we reminded her). These were OK but I probably wouldn’t order them again. 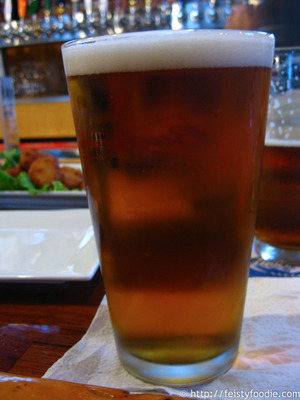 My first beer was the Sierra Nevada Pale Ale that I’ve enjoyed in the past. TC ordered… I don’t know, but maybe he’ll tell us? 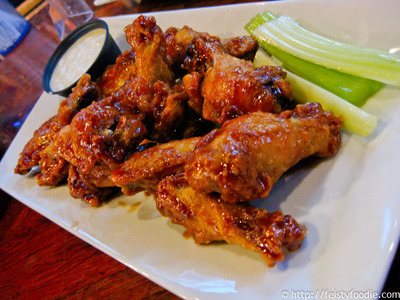 Though wings are not included in the special $5 apps, we ordered them anyway. I enjoyed these – meaty, flavorful. Nice to munch on while we drank. Mac&cheese bites – yes, that’s right. 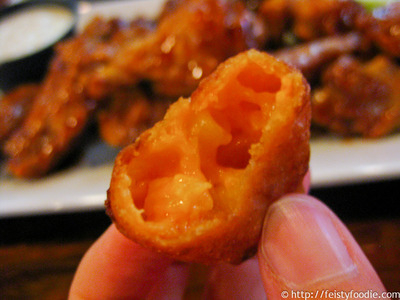 Deep fried mac&cheese. With a side of liquid cheese for dipping. Yep. Honestly, these tasted like boxed mac&cheese – which isn’t a horrible thing, it’s been so long since I had that – but the longer they sat and cooled, the worse they tasted. So if you get these, don’t bother being polite and letting other people eat, just scarf them down while they’re still hot. I really should go look at a beer menu to see what I was drinking… or maybe write it down next time. Yvo says: Lovely happy hour deals – check the website to see what that day’s deal is – and a great space, pretty big, lots and lots of TVs showing the game(s) that night, and the crowd isn’t quite as bad as it could be given the location. Excellent beer selection, great pub grub, and not expensive… it’s not that close to the train station, but no matter. Oh yeah, and the bartenders are pretty good eye candy, I’m told. funny that a Canz just opened in Manhattan not too far from me. 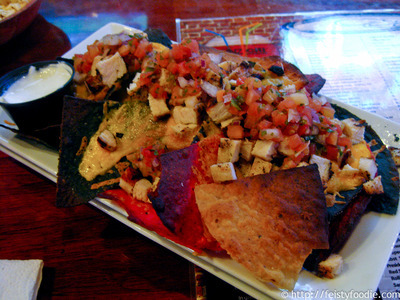 ugh burned nachos? i would have sent those back. fried mac & cheese is one of those dishes that everyone wants to order when they see it on the menu, but never turns out that great. a fishbowl? looks like Brother Jimmy’s has some competition now. hope the hangover was worth it. 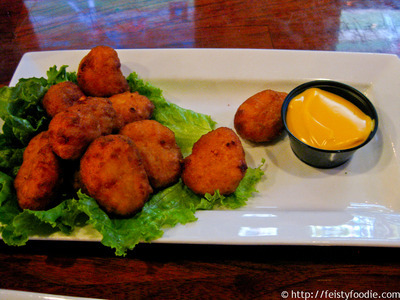 PS Brother Jimmy’s has the best fried pickles in the city. you can’t get hungover if you don’t have any alcohol left in your system. not a weak liver, just don’t drink things anymore that are electric blue. 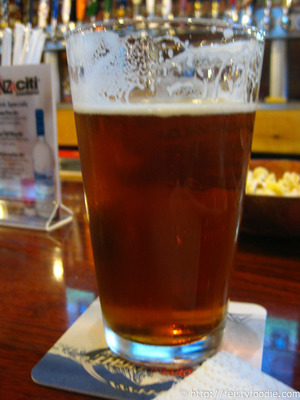 Generally it’s the impurities in your alcohol that give you the hangover. If you drink good liquor, you can probably stave off the hangover. If your beer isn’t laden with fusels (basically a different alcohol produced by the yeast) or other “bad” byproducts of the fermentation process, you’ll probably make it okay the next morning. Of course you need to make sure you hydrate before bed, too. Looks like an interesting place, looking forward to trying it. 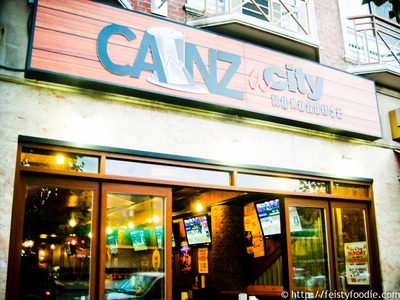 The beerz at this place look awezome, but I heard there was another kind of canz at this place that made it special… No picz of the hot girlz? el oh el Ben. I’ll be there again this week (and if you’re free, you should stop by! ), I’ll ask if they’ll let me take pictures but as someone who used to work behind a bar wearing skimpy clothes, if someone asked me that I would say no. 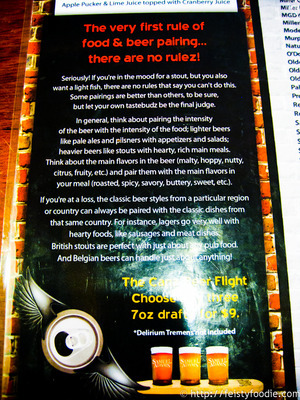 The beer list was pretty impressive to me, though I am by no means a connoisseur like you or Beer Boor. 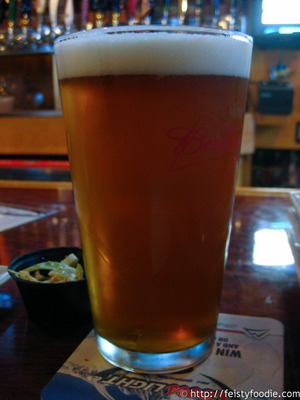 I had a delirium tremens (not pictured), captain lawrence pale ale, and magic hat (not #9), Very nice draft selection. The fish bowl was just ok. Hope to try another flavor soon. Kobe beef sliders were a good start. The chips for the nachos weren’t that great (Phebes way better of course). I enjoyed the wings too. Glad I went to Canz despite rain-out. Did you guys sip the fishbowl from that giant straw? Lady and the Tramp style while looking into each others’ eyes? Not when I was in the cross-hairs of Gary. 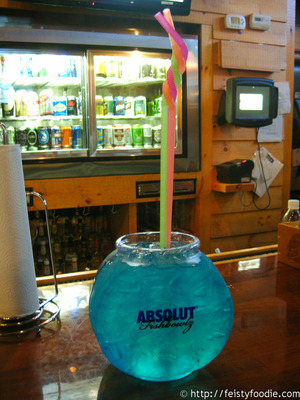 It was a fishbowl for 3. Make sure Mr. M&P comes out to HH so you two can share one. 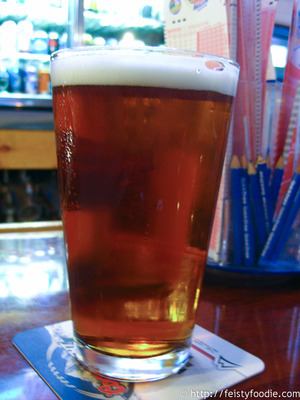 I used to like beer, and when I did I found the only two foods I could drink it with were blue crabs and pizza. Weird, huh? Otherwise I drink tea or water with my meals. Good deal on the sliders/fries and the nachos – too bad they weren’t better. They look good in the pic’.